The Sea of Tweets will allow viewers to tweet wishes to those affected in Japan in the wake of the terrible earthquake and tsunami of March 2011. Participants tweets from around the globe will be transformed into paper cranes in the color of forsythia flowers (rengyou), the color of hope. Tweets will also be placed around the northeast coast line of Japan focusing on areas affected by the tsunami, but viewers might not be able to see them there for a while until the infrastructure is restored. 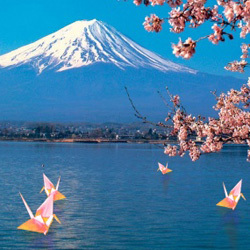 In the meantime paper cranes will also be placed in other parts of Japan where people can see them without problems. The rest of the world will be given the telepresence experience and can see Japan’s northeastern Pacific coast. The sea will be filled with participants’ tweets in the form of cranes – the first crane tweets are already in place. Once conditions return to normal in the areas affected by the disaster, viewers will also be able to see the cranes on-site, riding on the waves of the Pacific coast.